The funding for climate finance in Germany is coming mainly from the federal budgets of the Environment Ministry (BMUB) and the Development Ministry (BMZ) and a large share is channeled through bilateral development cooperation. 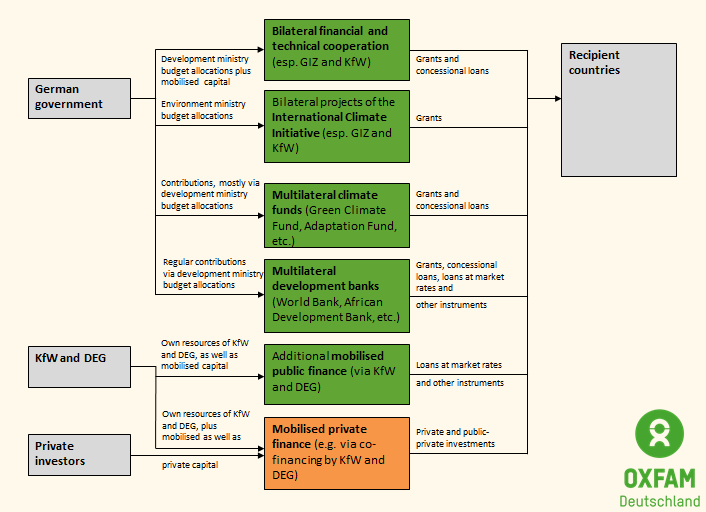 Germany also makes regular payments to multilateral climate funds and participates in multilateral initiatives. In addition, Germany contributes to the budgets of Multilateral Development Banks (MDBs) which in turn fund projects for climate change mitigation and adaptation. The largest share of German funds for climate change financing (approximately 85% in 2015/2016) are disbursed through bilateral development cooperation. The largest share of the funding comes from the federal budget of the Ministry for Development Cooperation (BMZ) and is divided into the technical cooperation implemented by the Gesellschaft für internationale Zusammenarbeit (GIZ) and the financial cooperation implemented by KfW Development Bank. In terms of planning processes and implementation, there is no difference between the programmes or measures accounted as international climate finance and the traditional development cooperation, but they contribute to a varying extent to climate change mitigation and adaptation. This is often called “climate-relevant “development cooperation. In addition, a small part of climate finance comes from measures funded by BMZ, but implemented by non-state actors (non-governmental organizations, churches and political foundations) which fund projects in their partner countries. The German Environment Ministry (BMUB) has a separate funding mechanism with the International Climate Initiative (ICI) which has been funding projects for climate change mitigation and adaptation as well as the protection of forests and biological diversity since 2008. It is also a means for BMUB to build strategic alliances with countries in the context of the international climate conferences under the UN Framework Convention on Climate Change (UNFCCC). The Green Climate Fund (GCF) which was established as a new climate fund at the climate conference in Durban in 2011 and which is supposed to develop into one of the main channels for climate finance. The Adaptation Fund (AF) under the Kyoto Protocol which finances adaptation projects in developing countries. The Least Developed Countries Fund (LDCF) which is supporting LDCs, especially in financing their National Adaptation Programmes of Action (NAPA). The Special Climate Change Fund (SCCF) which is financing mitigation and projects in developing countries. The Climate Investment Funds of the World Bank which support the dissemination of climate friendly technologies for mitigation and more comprehensive programmes on adaptation to climate change. This includes the Pilot Programme for Climate Resilience (PPCR). The Forest Carbon Partnership Facility which is supporting developing countries in reducing emissions from deforestation. The Global Environment Facility (GEF) which is providing financing for the implementation of the Rio conventions in developing countries including the UN Framework Convention on Climate Change (UNFCCC). The Montreal Protocol Fund which is supporting measures for reducing ozone depleting substances in developing countries. The World Bank, the African Development (AfDB) and all other multilateral development banks are providing more and more funding for climate change mitigation and adaptation in developing countries and emerging economies. This happens in particular through the provision of favorable funding conditions for larger investments. Germany makes regular payments to the MDB budgets and therefore indirectly contributes to the funded programmes and measures. 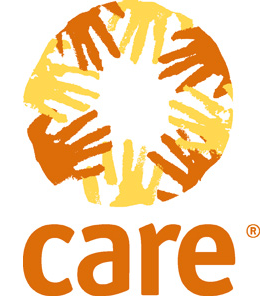 the InsuResilience Initiative for climate risk insurance which was founded as part of the G7 and extended through the InsuResilience Global Partnership. the African Renewable Energy Initiative (AREI), an Africa-led effort to accelerate and scale up the continent’s renewable energy potential. Another recent development in international climate politics is that public actors have started targeted actions for the mobilization of private capital. One initiative is the Global Energy Efficiency and Renewable Energy Fund (GEEREF). GEEREF is an instrument which the European Commission initiated for mobilizing risk capital for investments in energy efficiency and renewable energies in developing countries. Another instrument is the Global Climate Partnership Fund, which the German government initiated together with Denmark, Austria, the World Bank and the Deutsche Bank.